The premium fitness WordPress theme is unique, modern with stylish design and attractive look to make everyone fitness freak. It is immensely useful for gyms, yoga centres, fitness clubs, spas, physiotherapists, health centres and the list goes on. It is feature-rich to accommodate all the essential functionality to perform high-end tasks. Implementation of shortcodes to embed videos, event calendar, other file formats has made its code clean and easily understandable. Various sections are given on the home page which you can anytime disable/enable to suit your purpose. This fully responsive theme looks beautiful on devices of varying screen size. Being a translation ready theme, it breaks language barrier to entertain maximum people. You can use your site to sell fitness products as it is integrated with the WooCommerce plugin. 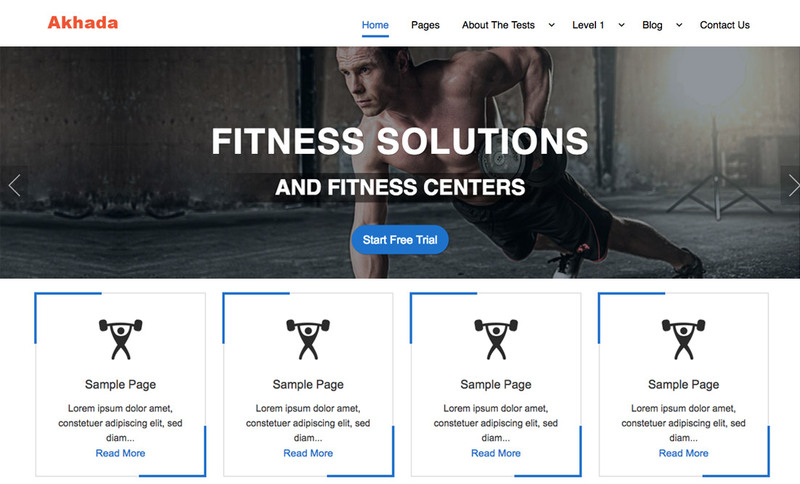 This premium fitness theme is easy to customize changing its header, footer, colour, background, logo etc. without requiring any coding knowledge. It comes with simple and mega-menu option to display pages and posts in an organised way. If you anytime get stuck in the sea of incomprehensible code, just contact our customer support and we will be happy to help you. Let customers trust you by seeing the testimonial section and the gallery section.